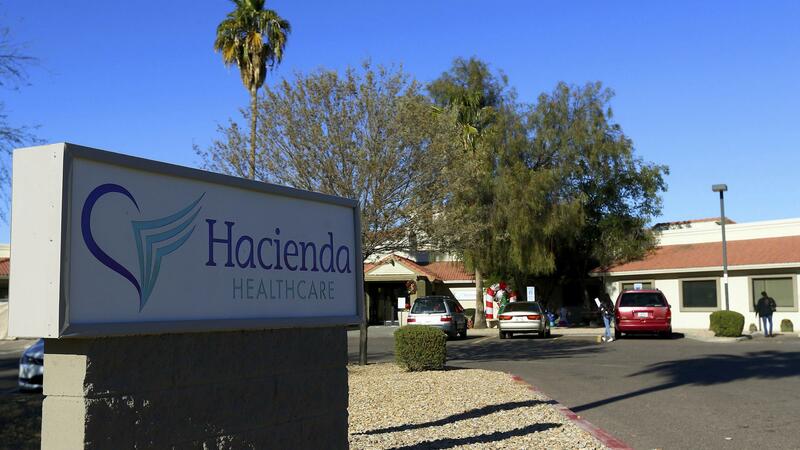 A 29-year-old incapacitated patient at Hacienda HealthCare in Phoenix gave birth in December. "[Police] have spent endless hours investigating this hideous crime," Interim Mayor Thelda Williams told reporters. "This is a facility that you should be safe in, and someone wasn't." The woman, a member of the San Carlos Apache Tribe, had been incapacitated for years when she gave birth to a boy on Dec. 29. According to a nurse at the Hacienda HealthCare facility who called 911 after the birth, employees realized she was pregnant only when she went into labor. News of the birth launched a police investigation into who impregnated the 29-year-old woman, whose name has not been released. Earlier this month, a Hacienda HealthCare board member called her case an "absolutely horrifying situation," and the company's longtime CEO, Bill Timmons, resigned. Two of the woman's doctors also are no longer at the facility, according to a statement from Hacienda — one resigned, the other was suspended. Earlier this month, the police obtained a search warrant to collect DNA samples from all the male employees of the facility. Sutherland was detained on Tuesday and underwent a court-ordered DNA test, said Sgt. Tommy Thompson, a public affairs officer with the Phoenix Police Department. The sample matched that of the baby. Sutherland had worked at the facility since 2011 and was one of the nurses responsible for the woman's care, police said. Officials noted that while the investigation is ongoing, there is no indication that anyone else was involved in the woman's assault. Police said it wasn't immediately clear whether Sutherland had worked at other care facilities. After an initial court appearance, he was ordered to be released on a $500,000 bond and is required to wear an electronic monitoring device, according to court documents. In a statement provided to NPR, Hacienda HealthCare said Sutherland had "undergone an extensive background check upon hiring" and was fired when the company learned of his arrest. State health agencies investigating Hacienda's skilled nursing facility in Phoenix after the birth had "several significant concerns" and issued a number of corrective active letters. They have ordered the company to hire a third-party manager to temporarily oversee operations at the building. The Arizona Department of Health Services tells NPR that it required additional safety measures at the Hacienda facility — including increased staff presence during patient interactions — and that those safeguards are ongoing. Hacienda HealthCare has also hired a former county attorney, Rick Romley, to conduct an independent safety review, as NPR's Vanessa Romo has reported. "I will be going in there and looking at the security surrounding the entire facility to make sure that there's no future harm to any of the other patients," Romley said a news conference last week announcing his investigation. Previous reports, citing a statement from the woman's tribe, said she is in a "vegetative" state. Her family described her condition differently in a statement released Tuesday by John Micheaels, their attorney: "She does not speak but has some ability to move her limbs, head and neck. Their daughter responds to sound and is able to make facial gestures. The important thing is that she is a beloved daughter, albeit with significant intellectual disabilities." Micheaels didn't respond to an NPR inquiry about where the woman is currently living, but Hacienda spokesperson David Leibowitz said in an email that she "has not been in Hacienda's care since giving birth." On Wednesday morning, Thompson said the baby boy is "doing good."